Assassin’s Creed Revelations is the next game for Ubisoft’s Assassin’s Creed series. It follows Ezio one final time as he retraces the footsteps of his and Desmond’s ancestor, Altair. When Ubisoft teased Assassin’s Creed Revelations with a screen of Ezio in Constantinople the thing that most stood out to us, apart from the incredible backdrop, was the hook blade. It seems like the perfect tool for any would be assassin for everything except assassinations. It took Alex Amancio, Revelations creative director, to put our doubts to rest. The demo shows us clearly how in a fight the hook could be useful, one guard was pulled up close so that Ezio could easily kill him and then a second guard was smacked under his chin with the hook and reeled in like a fish before getting the same treatment. Amancio said that the hook blade therefore adds fluidity to combat and it all speeds up climbing. Sort of like a perfect gadget then! In the demo, an older and more bearded Ezio is planning an escape of Constantinople via ship. A chain stretched across the harbor traps his ship and we join Ezio as he battles his way toward the tower where the chain is anchored. As he gets closer toward the guards we see him deploying an incendiary bomb, which causes quite a nice explosion! 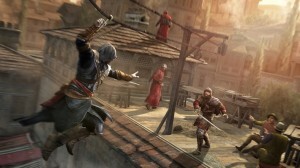 I am guessing that Ezio will have access to a whole array of new weapons and explosives to aid him. The demo goes on to show us how Ezio uses the hook blade to travel quickly from roofs as he zip lines from the exploding tower to a ship in the harbor. Ezio then sets about lighting every vessel on fire with a mounted flamethrower. He then escapes using more zip lines and kills a couple more guards before the demo ends. The song in the trailer is called Iron by Woodkid for those wondering.